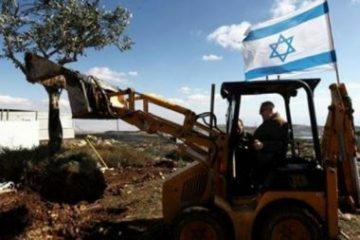 A group of extremist Israeli colonists invaded, Saturday, Palestinian lands close to Elon Moreh colony that was illegally built on Palestinian property, and started bulldozing large areas. 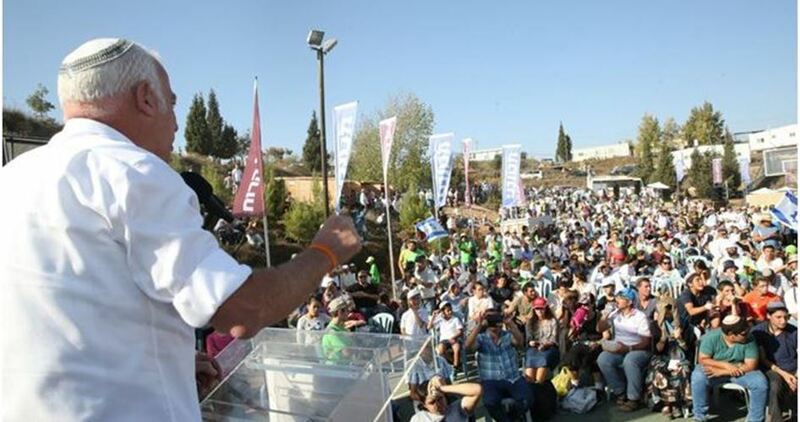 Ghassan Daghlas, the Palestinian Authority official in charge of monitoring Israeli settlement policies in the occupied territories, said the settlers bulldozed and uprooted large areas of lands belonging to residents from Deir al-Hatab town, east of Nablus. He added that the invaded and bulldozed lands are in Ras al-Ein , extending across large areas of farmlands and orchards, only two kilometers away from Elon Moreh illegal colony. The official also stated that the uprooting and bulldozing of the Palestinian lands aims at building a new illegally colonialist outpost. A horde of Jewish settlers, believed to be from Elei Zahav settlement, have appropriated a tract of Palestinian-owned agricultural land in Kafr ad-Dik town, west of Salfit. 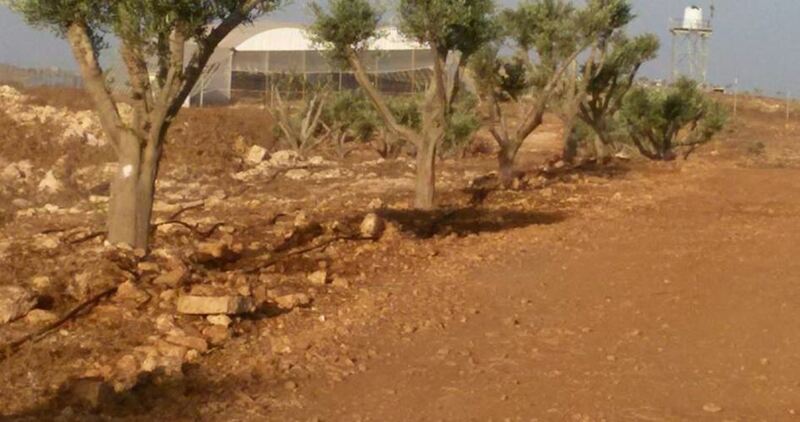 Local farmers said that the settlers had planted perennial olive trees in parts of Dohr Sobh area to the north of the town, pointing out that the Israeli army already bulldozed the same area. The area of Dohr Sobh belongs to farmers from the town according to ownership documents in their possession. 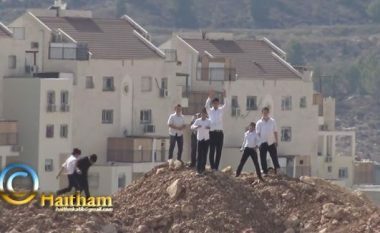 On Friday, several extremist Israeli colonists, taking position on a small hill behind the Annexation Wall, attacked the weekly nonviolent protest against the Israeli wall and colonies, in Bil’in village, near the central West Bank city of Ramallah. 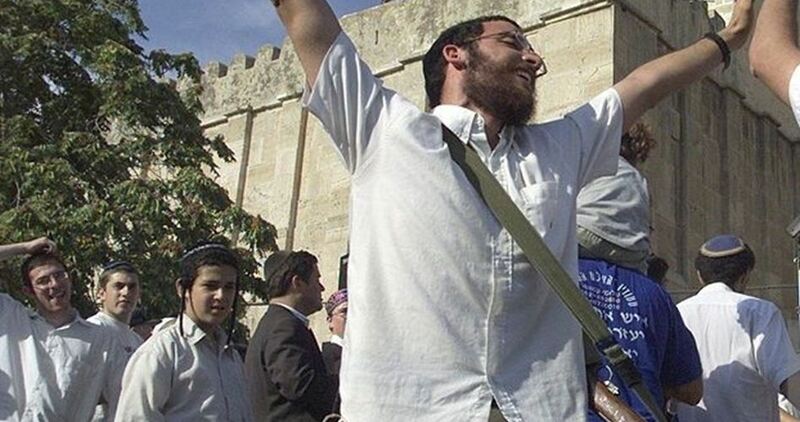 Dozens of Palestinians, accompanied by Israeli and international peace activists, marched from the center of the village, raising Palestinian flags, chanting for national unity, the liberation of Palestine, and the release of all political prisoners. The protesters marched towards an area that the Israeli army is planning for illegally confiscate, and started a cleanup of the Abu Lemon Reserve, before peacefully marching towards the gate of the Annexation Wall. Some protesters started banging on the gate, to send a message to Israel and its army that the popular resistance in Bil’in will never stop until liberation and independence, and the removal of all of Israel’s colonies in occupied Palestine, built in direct violation of International Law and the Fourth Geneva Convention. The soldiers did not attack the protesters, but a number of young fanatic Israeli colonists started throwing rocks at them, in addition to hurling racist insults and curses at them, while the army remained idle. A marathon race staged by Jewish settlers on Friday morning led to road closures and obstructed the movement of Palestinians between the north and south of the West Bank. 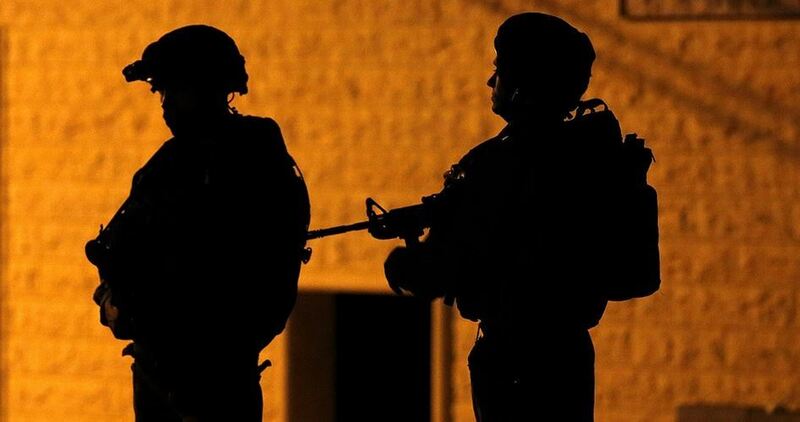 According to local sources, the Israeli occupation forces closed most of the main roads connecting the northern and central towns of the West Bank with the province of Ramallah and al-Bireh as a security measure to protect the participating settlers. As a result, these closures forced many West Bankers to use longer bypass roads to reach their destinations. Earlier, the Israeli army announced that these road closures would start at 6:30 am and end at 11:30 am in order to secure Road 60 (Ramallah-Nablus road), where the race took place. A large number of Israeli troops had been deployed during the race along this arterial road and other nearby main roads. Later in the afternoon, the Israeli army closed, with no known reason, the entrance to Sebastia town, north of Nablus, and embarked on intercepting Palestinian cars and photographing their license plates. Israeli settlers, on Thursday, reportedly took over a Palestinian-owned area of land in al-Humma region of the northern Jordan Valley, and laid down an infrastructure, according to a local official. M’otaz Bsharat, in charge of the settlement file in the Jordan Valley, said that settlers from the illegal Israeli settlements of Mechora and Sal’it, began placing wooden boards on land belonging to Palestinian residents in al-Humma almost a week ago. Settlers laid further infrastructure, including electricity and water lines. According to B’Tselem, an Israeli human rights center, since 1967, Israel has established over a hundred settlements in the occupied West Bank. “These settlements were established on vast tracts of land taken from the Palestinians, in breach of international humanitarian law. 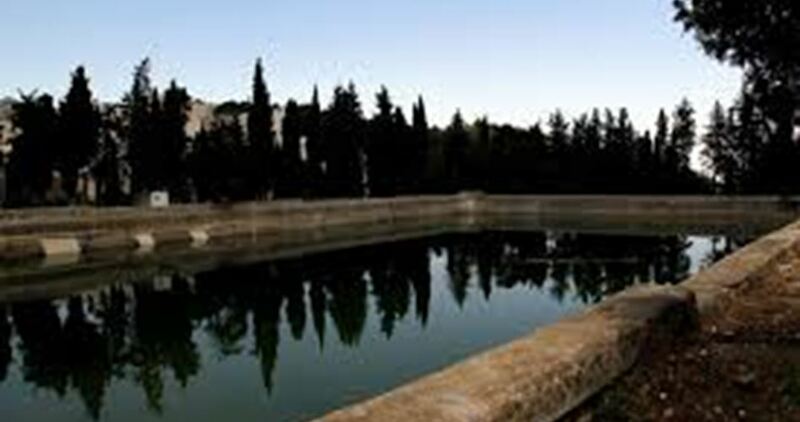 “The very existence of the settlements violates Palestinian human rights, including the right to property, equality, a decent standard of living and freedom of movement,” the group stated, according to WAFA. 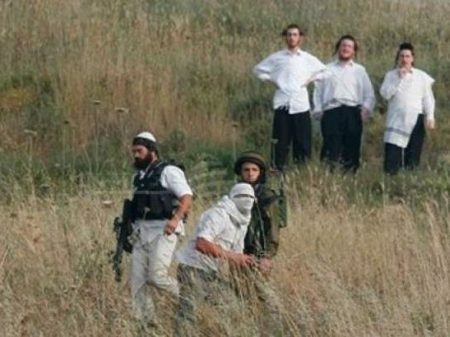 Dozens of Israeli settlers, on Sunday erected tents on Palestinian land located to the east of the town of Idhna, south of Hebron, chased Palestinian shepherds out and prevented them from grazing their livestock in the area, according to local sources. 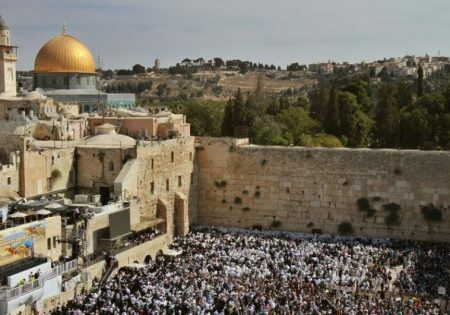 Sources told WAFA correspondence that settlers erected three tents on Palestinian land, located near the Israeli settlement of Adora and built illegally on Palestinian land, where they performed Talmudic rituals to celebrate the Jewish holiday. Ali ‘Ajajneh, one of the town locals living in the area, in tents and tin houses for the past 35 years, said settlers perform religious rituals in the area each year, during the Jewish holidays, and prevent shepherds from grazing their livestock as well as deny them access to a water spring in the area, all under the protection of Israeli army. According to B’Tselem, the Israeli Information Center for Human Rights in the Occupied Territories: Since 1967, Israel has established over a hundred settlements in the West Bank. “The very existence of the settlements violates Palestinian human rights, including the right to property, equality, a decent standard of living and freedom of movement. Israel’s dramatic alteration of the West Bank map has precluded realization of Palestinians’ right to self-determination in a viable Palestinian state,” the center maintained.